The EG-AR series is the latest addition to our range of manual and automated press brakes. 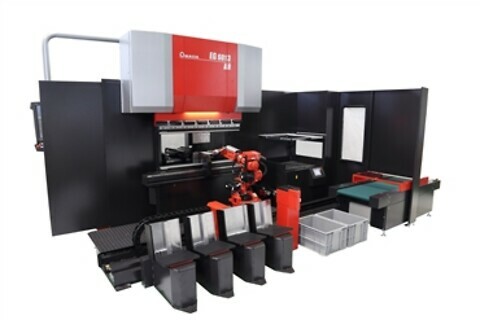 Designed specifically for high speed bending of small complex parts, the whole system is designed for unmanned production of any volume size or part mix. Equipped with the world's first twin servo electric drive mechanism, the EG-AR offers high-speed and high-accuracy bending, with less power usage and a compact footprint. Functies zoals automatische hoekmeting, offline programmering, meerdere partload / ontlaadstations en een automatisch gereedschap, die alle toevoegt tot de systemen, een indrukwekkende lijst van productiemogelijkheden.